To the right you will find a list of the towns, villages, and cities in Milwaukee County that have County Landmarks. Click on a location to see the landmarks in that area. 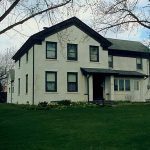 The Milwaukee County Landmarks Committee welcomes public nominations of local properties to be considered for designation as County landmarks. Proposed sites must be located in Milwaukee County. Sites within the boundaries of the City of Milwaukee, which has its own landmark program, may be considered. The deadline for submitting nominations is January 15 of each year. A separate form needs to be completed for each nomination. Fill out the County Landmark Application here. Designation as a Milwaukee County Landmark is intended to be primarily honorific and educational. Landmark status does not impose any restrictions upon the property or its owners. Identification as a Milwaukee County Landmark does not confer any special protection on a structure, provide it with any financial or legal advantage, or, conversely, modify or limit the owner’s property rights. In all cases, notice of nomination of a site for landmark status is provided to the owner in advance of the public hearing, and in all cases the owner’s wishes with regard to designation are respected. The primary purpose of designating a landmark is therefore educational: to provide the public with an informed list of buildings or sites of historic, architectural or cultural significance to the community. Only the moral force of public opinion – not anything in the law – can henceforth protect a landmark from demolition or serious alteration.